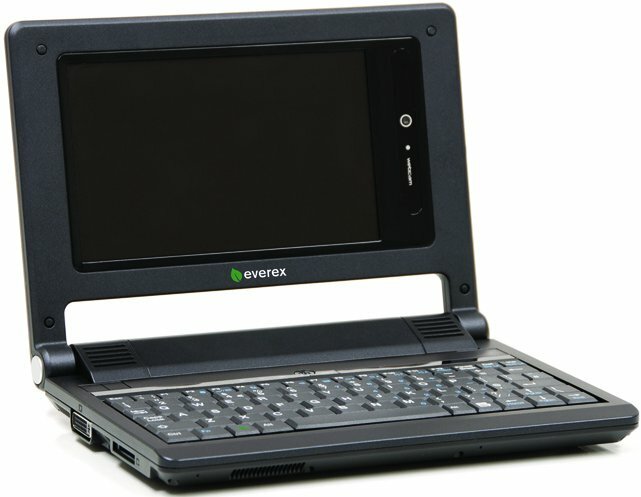 The OLPC XO isn’t the only tiny, small, dwarven laptop making news this month. the Eee PC is the most wanted laptop under trees this year, and other manufacturers have taken notes, if not exception, with the popularity. Everex, makers of all Peecees super-cheap, has what it thinks is a competitor on its blueprints. They’re calling it the Cloudbook, and it’s pretty hot, in a super-cheap and weak kinda way. Running the Via C7 processor (remember them?) at 1.7GHz, the tiny thing is totally usable. Forgoing NAND storage for standard, cheap HDDs saves money, but not power or time. But screw it, Everex is giving you a touchscreen and Linux, making this an appealing machine. No full pricing yet, though $400 is the low-end for this series. We’ll be previewing this slender laptop at CES next month, and with a ship date of January 15, we’ll likely have a production version to show you.